Dave Cockwell freely admits that he wasn’t over-endowed with qualifications when he left school at the age of 15. It didn’t matter to him, because he’d discovered his vocation years before – and it lay in boats. Despite not coming from an especially nautical family, Cockwell had barely reached double figures before he was helping his plasterer father convert an old ship’s lifeboat into a rudimentary cabin cruiser in the garden of their Bristol home. By the time he was in his teens he had become well known around the city’s harbourside as “the lad in the little RIB” who would do odd jobs on boats for pocket money. “After that, I just became a hired hand, helping people with repaints, carrying out general repairs and even building small boats from the ground up,” says Cockwell. “I’d make my money during the winter, and then go off sailing for the entire summer.” As unconventional as it may sound, it was a formula that worked because, by 1996, Cockwell had learnt his craft so completely that he was able to found a boat-building business in Bristol’s historic Underfall Yard, where he ended up employing five staff before a growing family prompted a relocation to Cornwall in 2002. Since then Cockwells, as the company is called, and its Mylor Creek Boatyard in Falmouth have developed a worldwide reputation for excellence in restoration, refitting and preparing all types of traditional and modern boats up to 25 metres in length. In particular, it has carved a niche with its exceptional bespoke-built Duchy motor launches that range from 6.2 to 18.2 metres and cost from £35,000 to £800,000. 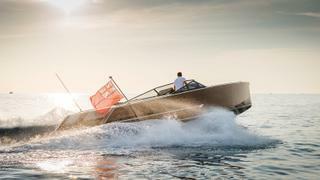 When it comes to building boats, Cockwells is not restricted by design or materials, as evinced by Gaya, the remarkable, 10.5 metre Titian Tender you see here. A single photograph of this elegant beauty was all it took to convince me that a short-notice opportunity to sea trial her in Antibes was not to be missed. I was soon on a flight to Nice and, three and a half hours later, found myself standing on a rain-soaked dockside looking down on the boat for real. A storm had recently passed, dusk had reached its dark end and the resulting ethereal light endowed her with a slightly menacing appearance. She looked, as I remarked to Cockwell, “like a gentleman’s interpretation of a Wallypower”. That description sprang to mind because, while the Titian Tender is stylishly futuristic in shape, her planking of rich Burmese teak and that deeply scalloped bow lends her an elegantly traditional aura that’s enhanced by copper-infused caulking to the deck – a masterful touch that creates a play of light the like of which I can’t recall seeing on any other boat. Looking at Gaya in the flesh, it’s difficult to believe that the original design sat around for close to a decade before being brought to life by Cockwells. “The rendering was done by RWD and became part of the portfolio of possible designs we promoted at boat shows as a means of attracting commissions,” explains Cockwell. The woman in question is the highly successful South Korean artist Minjung Kim, who worked closely with the yard on the detail of the boat, specifying Silvertex upholstery in an exquisite soft gold colour, concurring with Cockwell to keep deck fittings as minimal as possible to preserve the design’s clean lines and, in an exceptional personal touch, creating an abstract artwork painted on silk that serves as the saloon headlining. Despite Gaya’s sporty appearance, she’s a surprisingly well-appointed boat that can carry up to a dozen people, although eight is perhaps a more comfortable number. 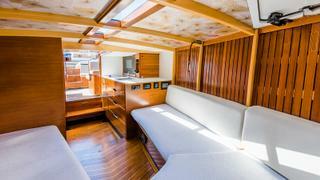 A forward V-berth accommodates a double bed, there’s a small head and shower and an adequate galley with hob and fridge plus some neat fold-out dining tables towards the stern for serving drinks and snacks. There’s space enough, in fact, for a couple to enjoy an intimate overnight stay – and the facilities are ideal for keeping everyone refreshed during a long day out on the water. 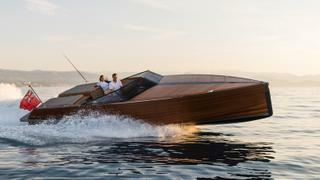 But while artisanal touches abound, Gaya is also a thoroughly modern and sophisticated boat where it counts. 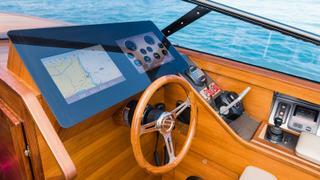 The cockpit, for example, is equipped with a custom-made touchscreen system by Yachtcontrol that’s used to operate everything from the air conditioning to the electric-powered bimini that folds invisibly below decks in a matter of seconds yet provides an elegant addition to the boat when in use. So, in terms of looks and fittings, she seemed to be everything anyone could wish for in a thoroughly modern, retro-looking tender. But how does she perform? I was to find out first thing the next morning, by which time the foreboding skies of the previous night had given way to a day filled with cloudless, sun-soaked promise. On taking the controls, the feature of the boat that immediately makes itself felt is its sheer ease of manoeuvrability – something one might not expect from a wooden-built five-tonner if you didn’t already know that it was equipped with the excellent HamiltonJet system that Cockwells specifically used for its combination of pinpoint accuracy and luxuriously effortless feel. Beneath the hydraulic engine cover lurk a pair of Yanmar V8 diesels that endow Gaya with a useful 640 horsepower that, out on the open water, provides the boat with truly exhilarating performance. Cockwells claims a maximum speed of around 35 knots, but it’s the way that Gaya majestically accelerates from a trickling pace to hoisting her bow out of the water and hitting the plane that really impresses. It’s a seemingly effortless action and one that’s performed with the utmost smoothness. Despite the boat’s £1 million value, both Cockwell and Gaya’s captain, Milo de Glanville, encouraged me to unleash all the power at my disposal – and, best of all, make the most of the incredible handling and responsiveness resulting from the combination of jet drive and the brilliant hull design that allows for everything from unfeasibly tight, high-speed turns to sudden, extreme deceleration to be carried out with the minimum of drama. The proof of the Gaya pudding, however, is that Kim has used her several times a week during her first summer of ownership and feels that she has added a new and special dimension to her life. “To me, Gaya is like a sculpture on the sea that can provide both the peace and tranquillity of being close to the water and the exhilaration of incredible speed,” she says. “Having this boat has created a sort of dream in my life, and working with Dave to build it was a truly wonderful experience. I really felt we had an affinity brought about by the fact that we are both artists in different ways. In fact, the only reason I would sell Gaya is to provide the excuse I need to build another boat with Cockwells.” Is that what’s known as a satisfied customer? I think it might be.